Welcome to the Brothers Grimm biography! Famous for: Their fairy tales, of course! But the Brothers Grimm also composed a German dictionary, protested against, and were banished by, the king of Hannover, composed a collection of 585 German Legends and introduced a new subject in higher education - German studies. The Brothers Grimm were born in Hanau, Germany. Jacob was born on the 4th of January 1785 and Wilhelm - on the 24th of February 1786. From early youth, until their death, the brothers were very close friends, always complementing each other. Their father, Philipp Wilhelm Grimm (1752 - 1796), was a lawyer. After his passing, the Brothers Grimm were able to finish their education only thanks to the generosity of their aunt. The Brothers Grimm showed their brilliant abilities while they were still young. After a graduation at the Kassel School, the Grimms continued their education at Marburg University, with the firm intention to become lawyers, following the example of their father. They listened to lectures at the Law School, studied legal science, but their natural inclinations led them in a completely different direction - the study of German and foreign literature. In 1803 the famous romantic Ludwig Tieck issued his "Minnelieder aus der schwabischen Vorzeit". In the preface he strongly urged to study the native cultural heritage. Under his influence, soon after graduating, Brothers Grimm decided to inspect the manuscripts with ancient German literature and continued their research in this area until the end of their life. In 1805 Jacob Grimm went to Paris to do scientific work. The Brothers, accustomed to always live and work together found their parting difficult and decided never to be separated again. Between 1805 - 1809 Jakob Grimm was a librarian to Jerome Bonaparte in Vilhelmsheg. After the war with France, Jakob Grimm received a task from the Elector of Kassel - to go to Paris and return to Kassel Library manuscripts which were stolen from the French. 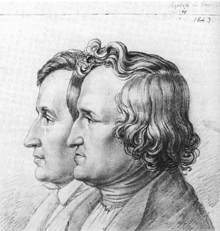 In 1815, together with a representative of Kassel, Jacob Grimm was sent to the Congress of Vienna. He looked down upon a prosperous political career - all business matters were an obstacle to his scientific pursuits. Jacob left the service in 1816, refusing a proposed professorship in Bonn, along with a high salary, and became librarian in Kassel, where his brother worked since 1814. The Grimm Brothers kept their humble position, devoting themselves to their research. In 1825 Wilhelm Grimm married, but the brothers still continued to live and work together. In 1829 there was an opening for the director's position at the Library of Kaseel. The position should have been awarded by Jacob Grimm, but another person, one without any merit, was preferred. Brothers Grimm felt so outraged by this injustice that left. Of course, they did not stay without a job - their scientific works were already too well-known. In 1830 Jacob Grimm was invited to Göttingen, became a professor of German literature and a senior librarian in the Göttingen University. Wilhelm received a junior librarians position in 1831 and was awarded the title of supernumerary, and later in 1835 - a full-time professor. There the brothers worked with a group of progressive scholars, especially Germany's science luminaries. But their stay in Göttingen was short. The new King of Hanover, who came to the throne in 1837, decided to remove the constitution granted to Hanover by his predecessor with a single scratch. Of course, discontent swept through the country, but only seven scholars had enough courage to openly protest. The Brothers Grimm were among these seven brave men. King Ernst August immediately responded to this protest with the dismissal of the seven professors and drove away those who were not born in Hanover. Within three days the Brothers Grimm had to leave town and temporarily settled in Kassel. Public opinion in Germany supported the famous scientists: a petition in favor if the Grimms was opened and the two most famous publishers in Germany, Reymer and Girtsel, offered to publish a German dictionary compiled on a broad scientific basis. Brothers Grimm accepted this suggestion without hesitation and after quite a long preparation they started to work. But they did not have to stay in Kassel for long - their friends helped them. Their new patron was Crown Prince Frederick Wilhelm of Prussia. When in 1840 he came to the throne, the Brothers Grimm were called in Berlin immediately. They were elected to the Berlin Academy of Sciences, and as academics have been granted the right to read lectures at Berlin University. Soon after Wilhelm and Jakob Grimm began to read lectures at the university and lived in Berlin until their death. Wilhelm died on the 16th of December 1859 and Jacob followed him on on the 20th of September 1863.